East Yorkshire-based Kingston Joinery has completed the installation of 2,000 square metres of windows as part of a £1.4m contract on the first phase of works at the award-winning North West Cambridge development. The largest single capital project undertaken by the University of Cambridge in its 800-year history will effectively see a huge extension to the city created to provide affordable housing, student accommodation, a school, nursery, doctors and community facilities. Teams from Kingston Joinery, in Melton, have installed composite windows on the residential element of the development, working for contractors Bam Construct. They joined around 1,000 other workers on site with other contractors including Wates Construction and Willmott Dixon overseeing various parts of development at the new £1bn district. The first phase comprises 700 homes for key University staff, a post-graduate student complex for 325 students and community facilities including a primary school, supermarket, parklands, play areas and sports fields. Craig O’Leary, managing director of Kingston Joinery, said: “This is another fantastic project to add to our port-folio and another example of our teams being entrusted to work on one of the country’s biggest developments. “The result of phase one is quite stunning and it is amazing to see a development of this size coming together. It is development and regeneration on a massive scale. “There were challenges on this job for us, not only logistically given the scale of building work happening on site, but also as our work involved the need to use specialist glazing lifting equipment to reach higher levels and also some intricate detailing and feature panels around the windows. 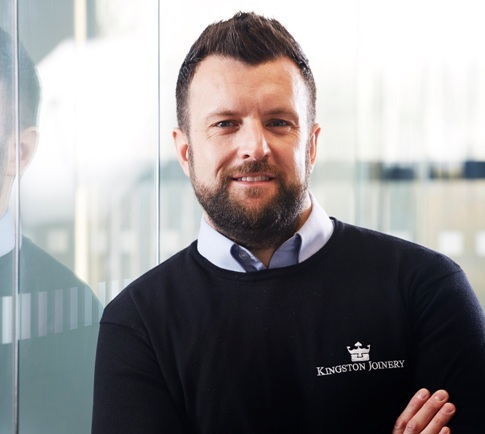 Kingston Joinery is on course for its most successful year in business since it was established in 2007, and earlier in the year celebrated securing a number of new contracts worth in excess of £4m. These included work on a new multi-million pound residential development in Leeds, at the new Hilton Hotel at Doncaster Racecourse and at an £8.5m 11-storey student accommodation complex in Sheffield. The North West Cambridge development is the largest real estate project ever undertaken by the University of Cambridge. The development was recognised three times at the 2018 Planning Awards, winning in categories for Planning for Affordable Housing, Planning for the Natural Environment, as well as the Editor’s Choice Award as the best overall scheme from the range of categories. The masterplan for development also won the Masterplan of the Year award at the inaugural Architects’ Journal Architecture of the Year Awards in 2017. Half of the 3,000 new homes being built in total will be ‘affordable’, alongside 2,000 postgraduate student bed spaces and new academic and research spaces.